I hope they clean up after themselves when they are done! The exterior doors in our house are quite old. The storm door at the back that goes from the dining room to outside has been in exceptionally rough shape. We had a big gathering with Greg's family earlier this summer. It happened to be on a very rainy, humid day. After all the ins and outs that occurred that day, the door fell off square, and wouldn't shut all the way. Greg was able to fix it, but the delay on the closer never recovered. The door has been slamming shut every since. Slamming so hard, it could probably take a finger off. Well, this weekend we had a small cookout, and all the slamming turned out to be too much for the door. The glass portion of the door cracked into two large pieces. So...we'll need a new storm door, eventually. Thankfully, the nice weather is just about behind us, so we need to leave it open for circulation. We have so few operable windows on the main floor of the house, that the screen doors on both the front and back are very important to getting a breeze. But, we should be able to wait until spring to sort this out. 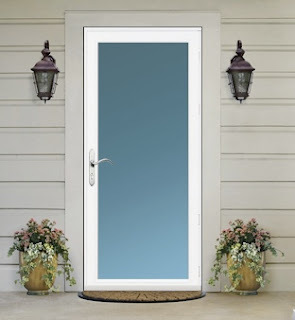 In the meantime, I'm hoping we can replace the aluminum door, which has a metal panel on the bottom, then glass in the middle, and a screen at the top, with a full view door like this. When the back door is open, it will let a lot more light into the house, not to mention, it will give the cats a floor height view into the back yard. They currently can't see out of the door now because of the metal panel at the bottom. Ah yes, the things we do for our cats. I know you're all shocked. The color we settled on for the master bedroom is a lovely warm shade of purple. It's a Sherwin Williams color called Kismet, which I found especially fitting since this was the name of my thesis design that I was working on when I met Greg. He helped me come up with the name. I'm loving the way the color looks with the wood and the bed spread. I am also working on getting some more orange in there for Greg through some accents. The coasters on the nightstand on the left came back from Africa with my sister in law. I found some orange baskets to coral the random items that tend to gather on top of our night stands and dressers. And, I'm trying to gather up some of the more eclectic, international feeling items we have in the house, especially in brown tones, an you can see in the vase. We have a great carved wood dragon that will end up in here eventually as well, as soon as we resolve our dresser/dressing table issues. Here's what the room looked like in progress. Greg was at work the first day. He moved the armoire for me before he left. I did the rest. I was quite proud! I washed the walls, taped, and moved all the furniture. I think it was well into the afternoon before I opened the paint! There are a lot of doors in the room, so it too quite a bit of tape! One of the features I'm most excited about with the new color (aside from the color of course) is that I painted the sloped part of the walls. Greg did not agree with this choice. He sees the slope as the ceiling. But, I see it as the wall. I think it makes the room look taller. And with the darker color against the white ceiling, we would have some really weird shapes created if the slopes had been left white. I finished the first coat of paint that day, but was out of energy, light, and time do do the second coat. Thankfully, Greg was around to help with that the next day. Now, the next project in here (well, aside from a dressing table waiting to be painted, and a never ending search for a larger dresser) is window treatments. I can't stand these roller shades for very much longer. So boring! I also need to peel off the foam that was sealing around the air conditioner, and paint the blocking white to match the trim. It's there for the air conditioner as well, and we found in our last house it was just easier to leave it here, and paint it, than to reinstall it every year. I've got some samples for wood blinds to look over. I'm thinking of a darker wood to complement the furniture. I really like the flexibility of blinds, but the cats are notorious for bending the slats of vinyl or metal blinds when they try to sit in the window which is why I am looking into wood. Well, that, and they just look better. Then, I would like to accent the sides with a drape. It probably won't close, because I want it long, and Greg won't want it to overlap the radiator. I'm thinking an deep orange would look quite nice with those other orange accents we have going on. Sometime toward the end of the summer, Greg installed the final pieces of out entertainment wall, the component rack and shelves to the right of the fireplace. It's taken me awhile to fill up the shelves. As you can see from my last post, my little collection of Halloween items has helped to fill some voids. After that, the Christmas stuff will take over. So, I guess I don't have to worry too much about styling the shelves for awhile. And, it should be an evolution anyway, right? I do need to take some time to update and fill up some of the picture frames though! That large purple one was a recent TJ Max find for $7.99. I think it's perfect for this room. You can also see that Greg got his speakers up on the wall next to the TV. We're still working on the cable management. We have some ideas. Just need the time to implement. He has the surround sound speakers on the wall now too, but hasn't had a chance to wire them. We loved this wall mounted component from IKEA because it allowed us to get up over the baseboard heat, and it left room for Greg's new sub woofer (which I have additional plans to hide even better in a different corner of the living room). Greg did a little hack job to add some drawer glides to make it easier to access the back of the receiver. Another project that is in the works here, is figuring out a way to screen the glass in the left most shelf. Our old coffee table had a lot of storage. The new one has none. Now, all the unattractive stuff is behind the glass door and I don't want to see it. I am experimenting with different contact paper stripes, etc. to create a frosted look. More on that when I finalize the plan. This Sunday, we also had our very first fire in the our fireplace, which was made possible by our conversion from oil to gas heat. I have yet to write about that process! And yes, it's Sunday, so Greg was watching football. Now, we need to work on getting a screen that isn't brass! Anyway, Roy decided to join in for a bit. Do you think I could convince him to sit on the back of the couch for the entire month? I'll tell you a little bit more about these shelves in my next post. I kept it fairly simple, and decide just to plant in the two areas next to the front steps I that I planted in the spring. I got daffodils, hyacinth, crocus and anemones. For full disclosure, I only managed to plant the daffodils so far. After digging 40 6" deep holes, my hand was killing me. I'll get the rest planted, in shallower holes, next weekend. I'm also taking some chances on the bulbs. Some of them want full sun, some want full sun/partial shade. Once the leaves are on the maple trees, our front yard is pretty shady. But, since the bulbs should be blooming before the leaves are on the trees, hopefully it will work out. The last thing I planted was a hydrangea that has been sitting on the front steps all summer. If it has a prayer of coming back, I needed to get it in the ground. I decided to use it to fill in this little gab between two of the bushes in the front. Maybe it will help disguise the hose and the gutter someday! Ultimately, I plan to get rid of most, if not all, of the forsythias along the red fence, and replace them with hydrangeas. There is an offshoot of the lilac bush trying to get started here too. Greg recently trimmed the forsythias, and did remove one of the far right to free up the lilac a little bit. It looks so much less cluttered already.